The far west side’s destiny as a forest of shimmering skyscrapers is drawing closer. 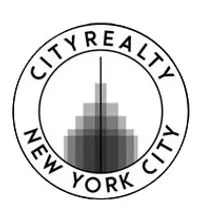 Over the years, real estate developer Joseph Chetrit has been debating whether to sell the modest-sized assemblage at 541-545 West 37th Street or redevelop the lot themselves. 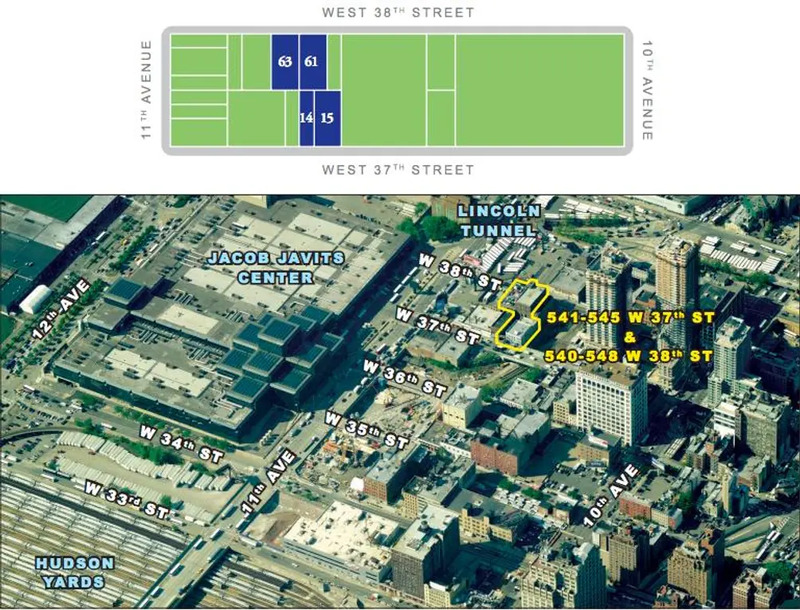 The uncertainty was laid to rest in late September when plans were filed to build a 48-floor mixed-use tower with 421 hotel rooms on mid-lower levels, and 135 residential units above. 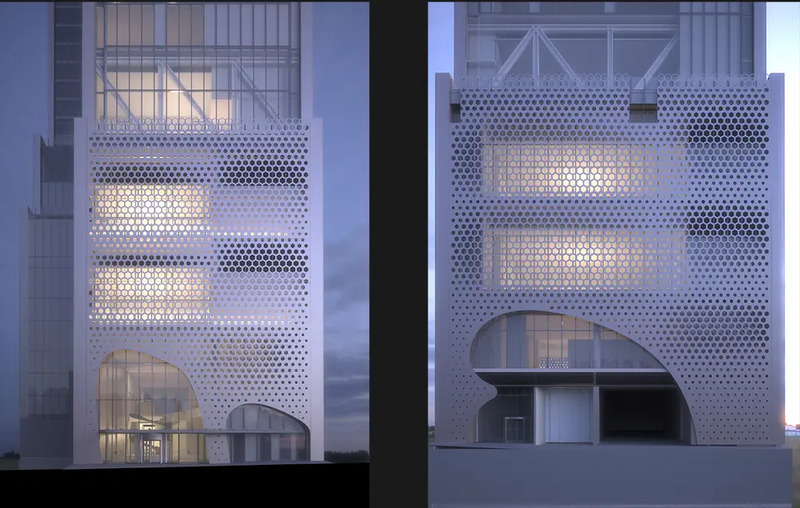 The high-rise experts at CetraRuddy Architecture, who are handling the design, have discreetly published a set of renderings on their website, showing off a high-tech skyscraper with a parametrically designed screen at its base. 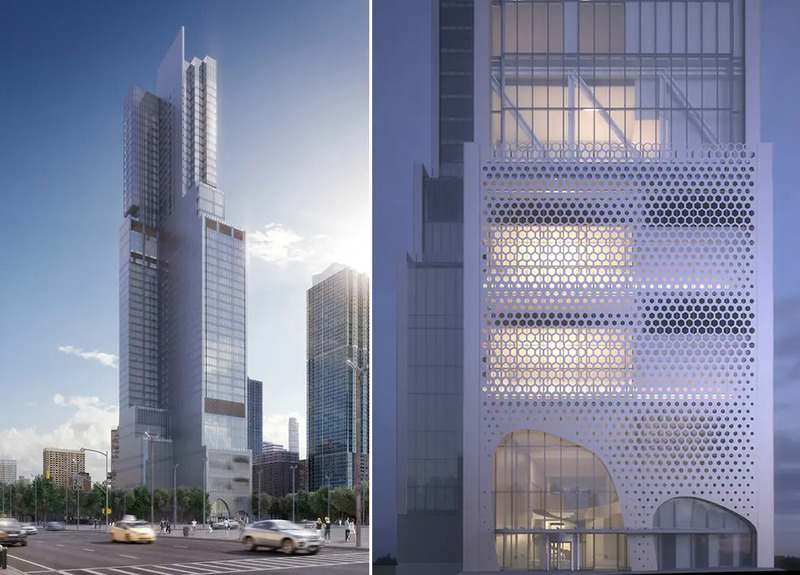 The tower will rise 622 feet high to the top of its highest floor, and its less-than-ideal through-block footprint will yield a somewhat awkward massing. 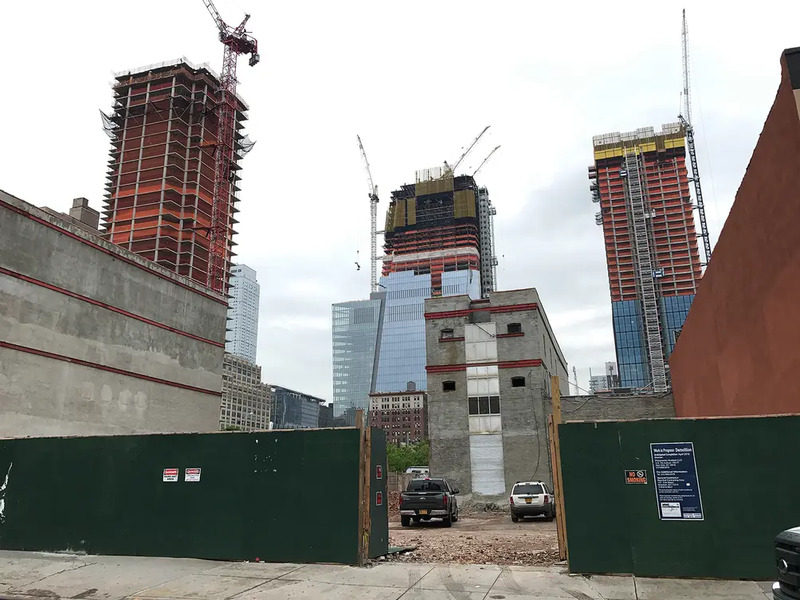 To the east, the building will overlook the future Hudson Boulevard Park; directly to the west, it may someday rise to similar-in-height towers, like BlackHouse Development’s 550-552 West 38th Street, and Siras Development’s Hudson Rise at 470 Eleventh Avenue. The 621,000-square-foot building will incorporate exhibition, retail, hotel, and residential uses. 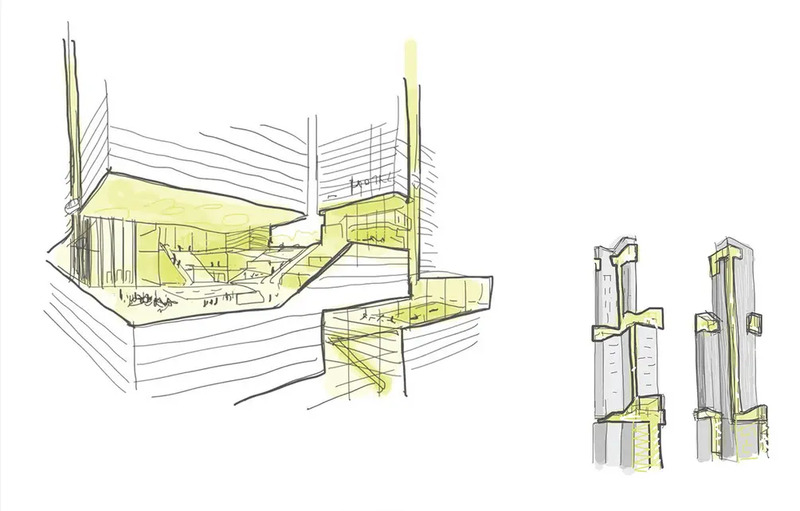 Per the filed permits, the podium will hold the lobbies, an event space, and two eating/drinking establishments. 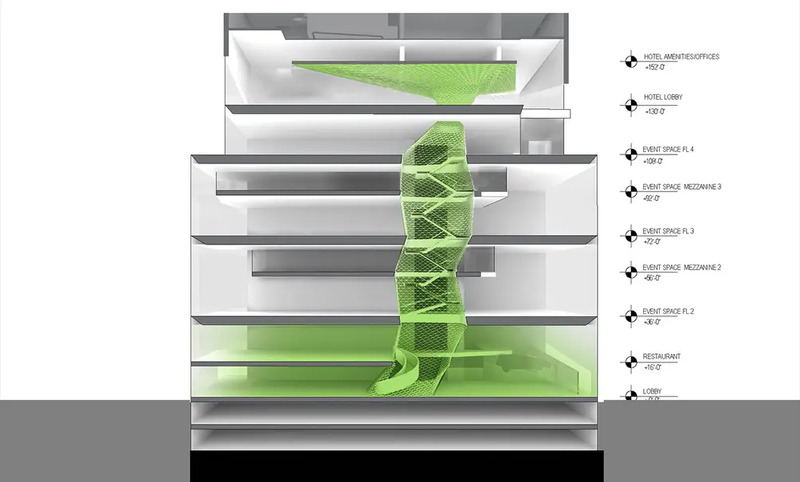 The design will take conventional high-rise programming to the next level by snaking in communal spaces horizontally and vertically throughout parts of the building. Amenities in the building will include a residential lounge on the 30th floor, indoor/outdoor terraces, a fitness/wellness center, a swimming pool, and on-site parking. The tower will rise on one of the most desolate blocks in the district, home to horse stables, parking lots, and a cut created from the Amtrak right-of-way. 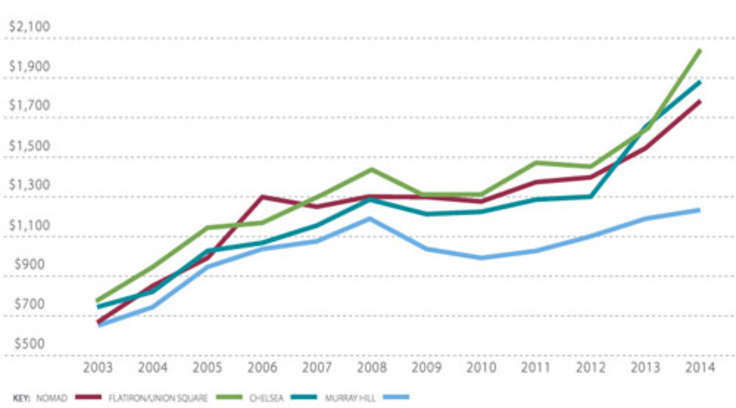 Chetrit purchased the site in 2012 for $26.5 million and recently began demolition on its low-slung buildings.